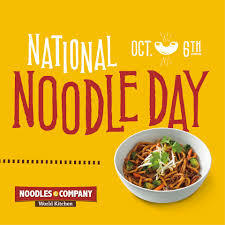 Noodles & Company is celebrating National Noodle ay on Thursday, October 6, by giving guests a free small bowl of Wisconsin Mac & Cheese with the purchase of a regular entree. Each guest who dines at Noodles & Company on National Noodle Day will also receive a buy-one-get-one (BOGO) coupon usable during a return visit in the coming weeks to enjoy one of three, NEW limited time mac & cheese menu items debuting on October 12: Bacon Mac & Cheeseburger, BBQ Pork Mac & Cheese, or Buffalo Chicken Mac & Cheese. National Noodle Day takes place on Thursday, October 6. This offer is only valid on Thursday, October 6.